Many unexpected tragedies like physical damage or theft may happen with your iPhone, eventually leading to the bigger loss i.e. the loss of your data. This means losing important and confidential stuff like your photos, contacts, emails, sms, etc. But iPhone data recovery software programs are the best way to retrieve all your lost data. Today, I’m going to brief you about Dr. Fone for iOS, an efficient software to recover all your lost data on iOS, iPad and iPhone. Along with this, I will guide you with all its features and the process to recover the lost data from iPhone. So let us start with the key features of this awesome application. What is Wondershare Dr. Fone for iOS? 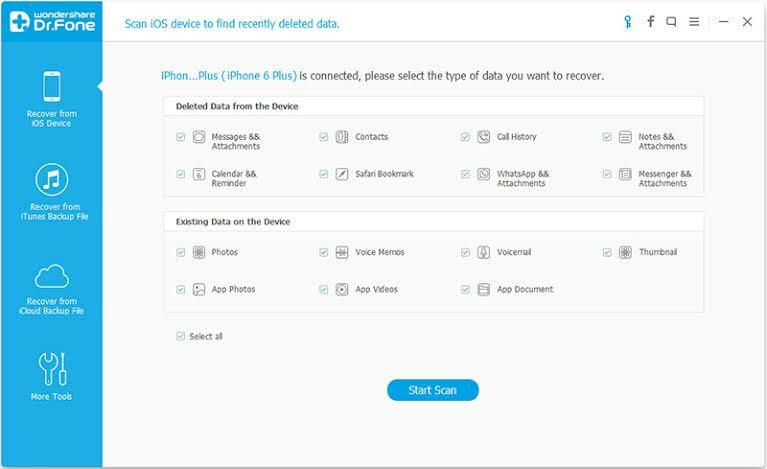 Well, Wondershare Dr. Fone for iOS is a very popular app for retrieving your lost data on your iOS devices like – iPhone, iPod or iPad. It includes iTunes as well as iCloud data which means, you can recover your complete lost data including contacts, logs, pictures, videos, accounts, apps, camera rolls, music libraries, voice memos, calendars, notes & also all the bookmarks of safari, etc. This software is compatible with all the versions of iOS devices. This software has very easy interface, you can also choose the recovery mode which suits your need. Also, this software allows its users to recover WhatsApp, Instagram, Snapchat, Pinterest, Flicker, Twitter, iMovies and many such apps. 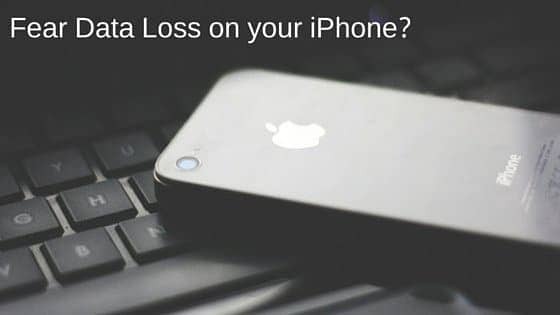 It allows you to scan for all your lost or deleted data from your iPhone or iPad and then recover all of them. You can choose data that you want to recover after scanning is done on your iPod, iPad and iPhone. 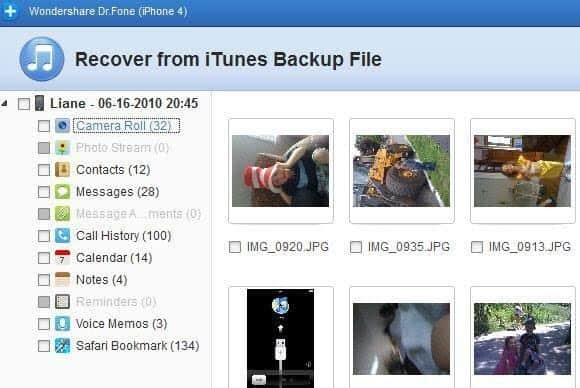 Dr. Fone for iOS will let you to download and extract the iCloud backup file without any additional cost. The most amazing feature of Dr. Fone is that after scanning your data that had been lost or deleted you can print the list of the entire data scanned with just one click. As we all know that apple doesn’t allow anyone to read the stuff of iTunes and iCloud but you will surprised to know that this amazing software allows you to read it for free of cost. Now, after knowing all the features of Dr. Fone, let us know jump to the tutorial in which I’ll guide you how to recover all your data by using Dr.Fone for iPhone. The first and foremost step is to connect your iOS device to the computer using the original data cable and launch Dr. Fone for iOS on your PC. Dr. Fone will automatically detect your ios device and will open a new window. Now second step is to scan your device for the lost or deleted files by simply clicking on “start scan”. Now, as you have already given the command to Dr. Fone to scan for lost and deleted files, so wait for it to be completed. It may take some time depending upon the size of the data being scanned. If your notice your lost file during scanning, then you can pause the process as there is no need to scan further. After the scanning is completed, you can select the files which you wish to recover and click on “Recover”. So if you want to recover your files from iTunes or iCloud backup, then you have to choose the following options after launching Dr. Fone on your PC “Recover from iTunes Backup File” or “Recover from iCloud Backup File” respectively for iTunes and iCloud. You can directly choose iTunes Data Backup file and then click on “start scan”. It may take a few minutes to extract all the data files from the iTunes backup store. Yo then need to choose the file which you want to get back and then click on “recover”, located at the bottom of the window. And you will have all your lost data with you. 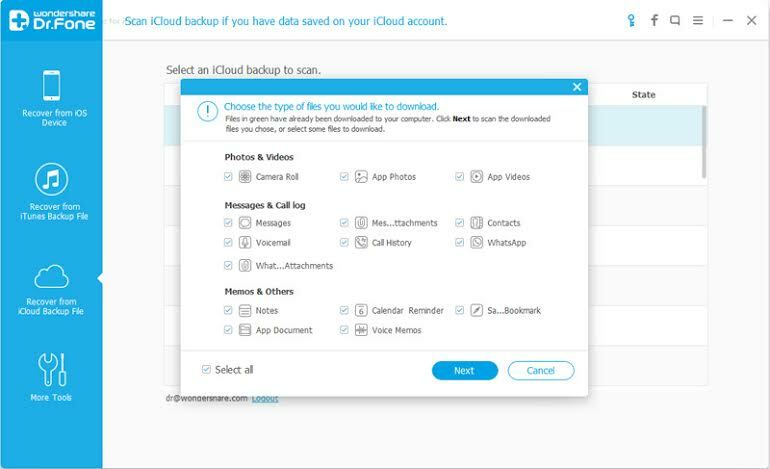 After choosing the option “Recover from iCloud Backup File”, you have to login on the iCloud for scanning all the backup files. Now, after logging in you have to choose the location where you want to store the recovered data and then click on ‘download’. When you find that the scanning has already done, you have to click on Preview and then you can choose your files and after that just click on “recover” button at the bottom of the window. So, that’s how you can retrieve all your lost or deleted data on your iPhone. Dr. Fone for iOS performs the recovery very efficiently. Why not give this software a try? Download Dr. Fone for iOS here: iPhone data recovery. Previous articleHuawei Honor 5C Review – A Budget Package Deal! Next articleMoto G4 Plus Review: Worth Buying It Or Not?